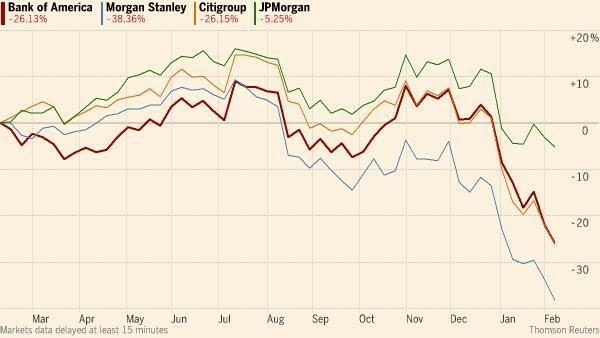 US bank stocks have suffered a brutal start to 2016. Out of the 90 stocks on the S&P financials index, just eight were in positive territory for the year at mid-morning on Tuesday. Two of the biggest losers, Bank of America and Morgan Stanley , are down 27 per cent and 28 per cent respectively. Citigroup , also down 27 per cent, is now trading at just 6.5 times earnings, not far off its post-crisis trough of 5.9 times, reached during the depths of the European debt crisis five years ago. Analysts offer a lot of different reasons for the big sell-off , but on this they agree. “Lift-off” in December was supposed to usher in an era of higher interest rates — which are always good news for the banks. In previous rate-raising cycles, assets have always re-priced faster than liabilities, earning banks a bigger spread between the yields on their loans and the cost of their funds. But worsening data since then from big economies, notably China, has investors worried that the world economy is a lot sicker than they had assumed. Expectations of another three rate rises from the Fed this year have collapsed in a matter of weeks. Talk of a rate cut, or even a move to negative rates, is entering the picture. Meanwhile, the muted reaction to Japan’s latest burst of monetary stimulus has fuelled concerns over the power of central banks to defibrillate the world economy. In itself, a lower oil price will not do much direct damage to the big banks’ balance sheets, say analysts. Total energy exposures amount to less than 3 per cent of gross loans at the big banks, which have mostly investment-grade assets, and which have already pumped up reserves . Perhaps more worrying are the second-round effects: if weakness in oil-dependent communities begins to spill into commercial real estate loan books, say, or if consumers find they cannot afford repayments on loans for their new gas-guzzling cars. In an environment of precious little growth — the big six US banks produced exactly the same amount of revenue last year as they did in 2014 — rising credit costs are likely to lead to lower profits. Every sell-off needs a point of focus and in recent days it has been Deutsche Bank . The contortions of the Frankfurt-based lender weighed on the entire banking sector on Monday, as it fought to dispel fears that it could not pay a coupon on a bond . These are confidence stocks. When markets are doing well, banks tend to do well, as companies feel better about doing deals and raising money, investors put on a lot of trades, and asset management arms benefit from big inflows. But when confidence disappears, banks tend to bear the brunt of the sell-off. Matt O’Connor, analyst at Deutsche Bank, notes that in 15 corrections going back to 1983, the US banks sector has been hit roughly twice as hard as the rest of the market — regional banks about 1.8 times worse, and capital markets-focused banks about 2.3 times worse. But none of these reasons is providing much comfort to investors at the moment. At Edward Jones, Ms Stemm is recommending clients ride out the turmoil by switching big global universal banks for steadier, US-focused lenders such as Wells Fargo and US Bancorp . “If there are global macro concerns, if recession concerns really are on the table, investors would rather get out than wait to see what happens,” she says.